Sony just announced the Dash (or as they call it, the "dash") is a crazy convergence of what we think of as a tablet with a stand-up widget device like the Chumby. It looks badass. Update: Hands-on! It's pretty interesting—not just a slab like a giant iphone, but an angled screen that stands upright, sort of like a Chumby with the power of a true tablet. Here are some more details on the tablet. Update: So I got to play around with the Dash, and it's not bad at all—but it's almost disturbing how much it's just a "Sony Chumby"—in fact, after asking the reps, we've confirmed that it actually runs a somewhat flashier version of Chumby OS. The screen is bigger and better than the Chumby One, and it must have a little heftier processor to be able to handle full-screen streaming video. It works almost exactly like the Chumby (makes sense, since it runs the same OS)—it's got a homescreen with a clock and some basic info like weather, in which a large rotating screenshot progresses through your apps (weather, Facebook, Twitter, NYTimes headlines, email, music, whatever). You tap on the app you want when it's pictured, and it opens up. It retains Chumby's best features, like being able to set just about anything as an alarm (music, Pandora, and now YouTube, if for some reason you want that), although it is significantly bigger. I like it, but it doesn't have any of the vintage cutesy charm of the Chumby, instead looking big (comparatively), black, sleek, and, well, Sony. It costs $200. LAS VEGAS (CES Booth #14200), Jan. 6, 2010 –Sony confirmed its commitment to providing consumers with innovative networked products with the introduction of the new dash™ Personal Internet Viewer. Featuring a vivid 7-inch color touch screen (measured diagonally) and access to over 1,000 free Internet apps, including news, calendars, weather, sports, social networking and more, dash utilizes an existing home wireless connection to continuously deliver Internet content to its viewers. "In today's connected world, Sony continues to look for ways to help enhance consumers' entertainment experiences throughout the home" said Brennan Mullin, Sony Electronics' senior vice president of the personal imaging and audio business. "dash empowers consumers with a fun, interactive way to stay connected with their news, entertainment, interests and ultimately, their lives." By bundling favorite pieces of the Internet together, dash provides always fresh, personalized content at a glance. The new product offers free access to all apps from chumby industries, inc. as well as the robust audio and video content from Sony's Bravia™ Internet video platform, including YouTube™, Pandora® Internet radio, Epicurious, Crackle, Livestrong™, Blip.tv and much more. Other content includes a NAVTEQ® app for easily accessible traffic updates on a customized route, and a Cozi™ app for simple management and synching of family calendars. Further, Sony Music Entertainment and Sony Pictures Entertainment will be contributing exclusive dash apps for movie trailers, music videos, custom user themes and more, including an app from Dr. Oz offering daily health and exercise tips. 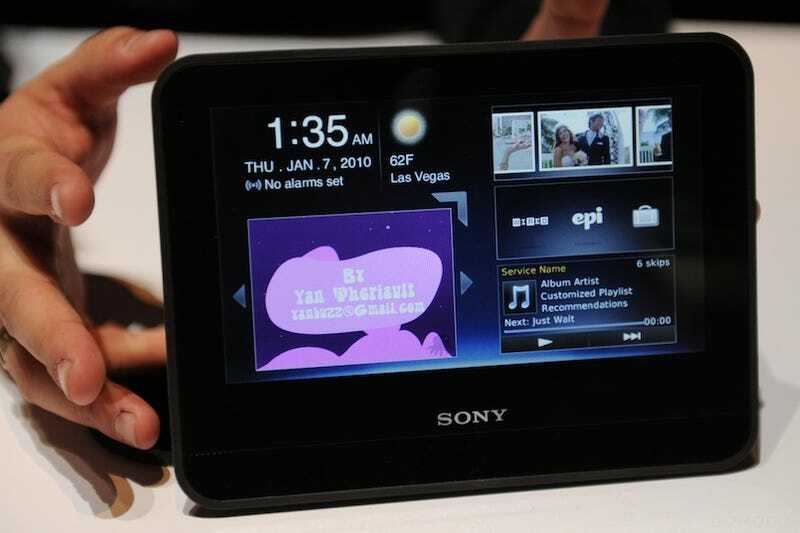 In addition, Sony dash can run multiple sources of content simultaneously, so for example, Internet radio can be enjoyed while browsing through online photo albums. Or, the alarm clock can be set to play selected online videos from music, sports and other news feeds. The device also allows users to choose apps either directly from the device or online through a PC, and new content for dash will continue to be added moving forward. Within the device, an internal accelerometer supports vertical flip, allowing for two optional viewing angles: upright, ideal for a table or nightstand; and tilted, perfect for a countertop. It also supports multiple user profiles and channels, allowing several members of the household to create and maintain their own customized view of the Internet. dash also features built-in stereo speakers as well as a USB port for simple connection to a variety of external electronic devices. An headphone output jack gives users the option to listen privately through headphones or through external speakers. Sony's dash will be available this April for about $199 at www.sonystyle.com, Sony Style® retail stores and a variety of authorized dealers nationwide.